IBackup enables backup and restore of several Office 365 Exchange mailboxes that are hosted online. You can backup and restore mailbox data such as email folders, calendars, contacts and tasks. By creating a new backup set with multiple mailboxes, you can schedule Office 365 mailbox backups. 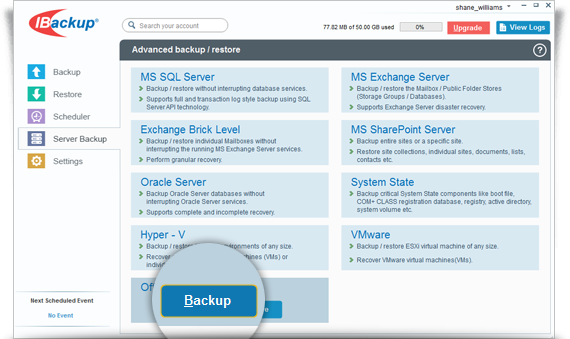 In addition, you can backup emails, calendars, contacts and tasks to IBackup in a compressed format. View steps to backup Office 365 Exchange Mailbox. By restoring lost, deleted or truncated Office 365 emails, you can ensure business continuity. Restore mailbox to Office 365 Exchange Online mailbox or locally. View steps to restore Office 365 Exchange Mailbox.